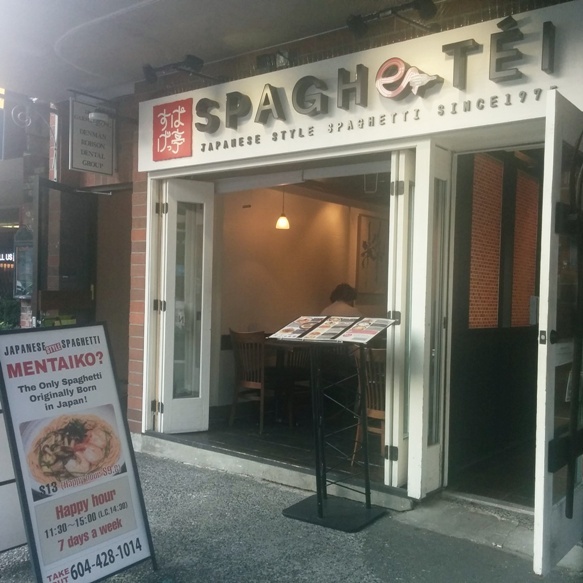 I was invited to try Spaghetei and they specialize in Japanese Style spaghetti (keep reading for a special coupon!!!). This is actually their second location and the first location outside of Japan. They have a Happy Hour special which is between 11:45am-3pm aka lunch time! All pastas are $9.80 instead of the usual $12-13 so lunch time is a good time to try them out if you’re in the area or working nearby. This entry was posted in Food Reviews, Japanese and tagged coupon, Japanese, pasta, shaved ice, spaghetti. 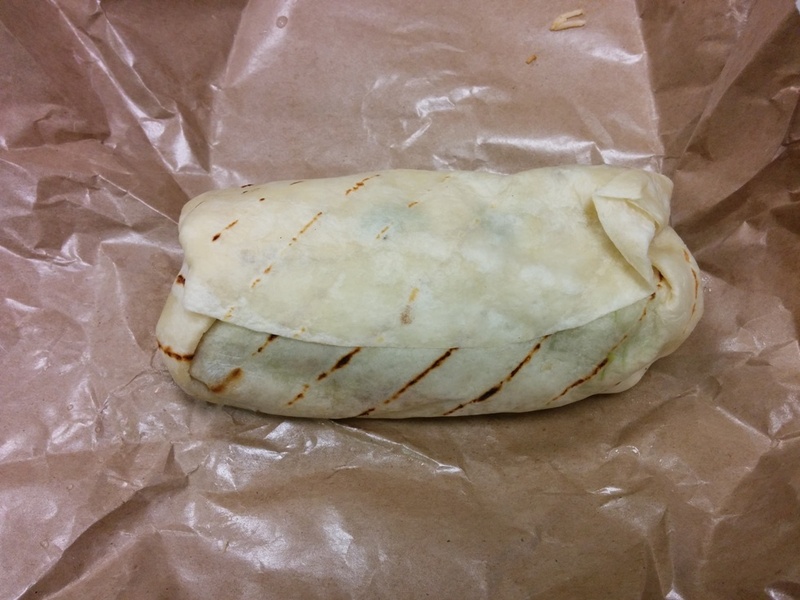 Zipang Provisions just started having lunch hours on weekdays so my co-workers and I decided to try it out. Before they only served lunch on weekends. Zipang Provisions used to be just Zipang and located on Main and 23rd? but they they moved to Main and 14th near Burgoo and next to the Last Crumb Bakery. Since they just started serving lunch, it was pretty empty. I like the the wood themed decor though it looks very nice and polished inside. To start, we shared the Chicken Kaarage with Garlic Mayo. There were five pieces but one was a lot smaller than the others. The chicken was very moist and juicy! Can’t go wrong with fried chicken! 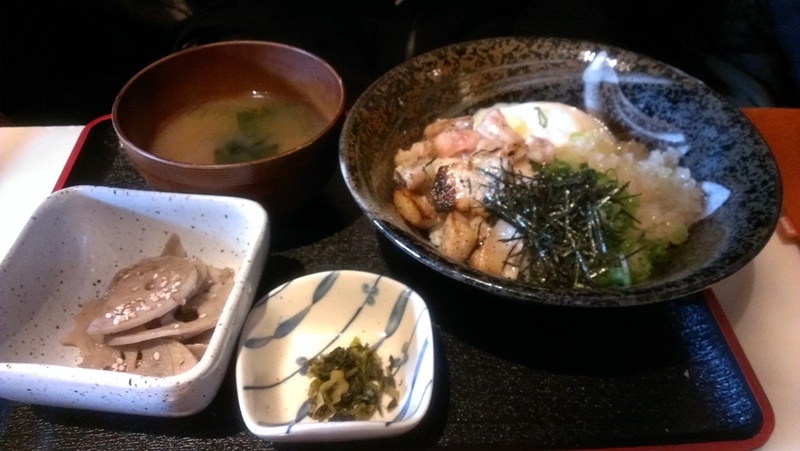 This entry was posted in Food Reviews, Japanese and tagged donburis, fried pork chop, Japanese, lunch, miso soup, rolls, unagi. 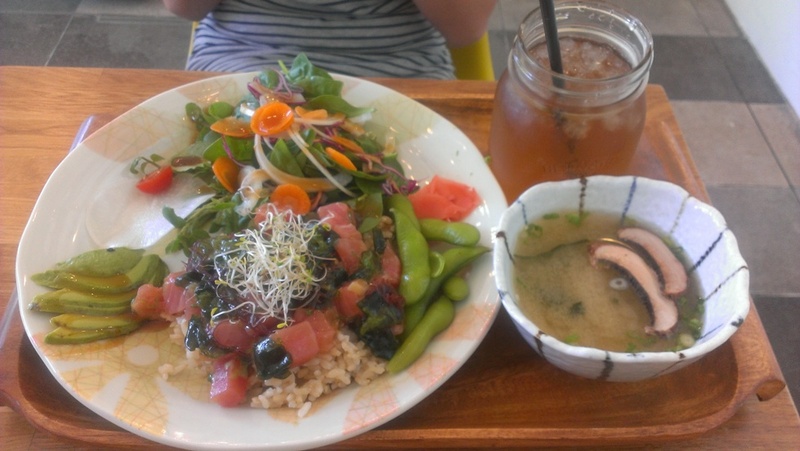 Shishinori is a new Japanese cafe that has set lunches and rice bowls as well as matcha desserts. It’s located next to Save On Foods on Cambie. The interior is wood themed and they were also projecting an anime on the back wall instead of using a TV which I thought was a smart idea. Besides lunch they also have breakfast items which they were still serving around 1pm when I was there. Maybe they serve them until they run out? There menu is displayed on the window for passer-bys to see. This was the Hawaii Ahi Poke Bowl and if you add $2.50 you can make it a lunch set with either a drink and soup or dessert. The presentation was absolutely beautiful! It was super colorful from all the different vegetables and nicely arranged. For the flavour, you can choose between spicy/shoyu/wasabi. The spicy flavour is apparently the most popular so we went with that. 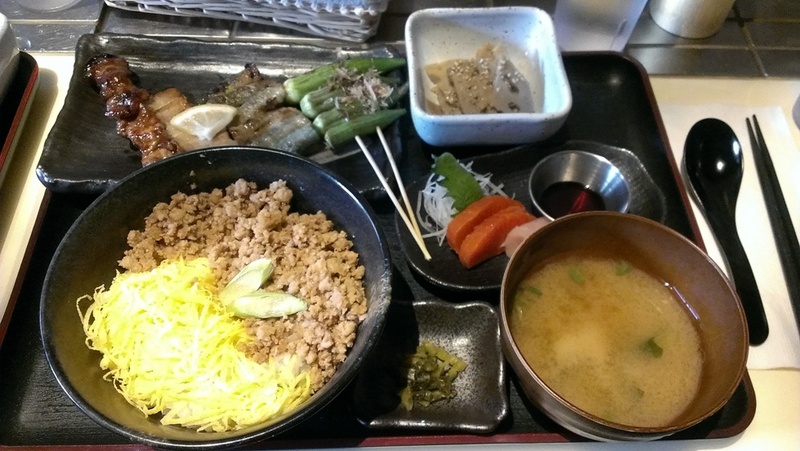 Shishinori also only serves brown rice with their meals so it is also a bit healthier. The drink was a refreshing Strawberry Iced Tea which had bits of strawberry floating in it and was not sweetened much at all . The soup of the day was a Portobello Mushroom Soup which was like a portobello version of miso soup. This entry was posted in Food Reviews, Japanese and tagged Breakfast, ice cream, iced tea, Japanese, lunch sets, matcha. 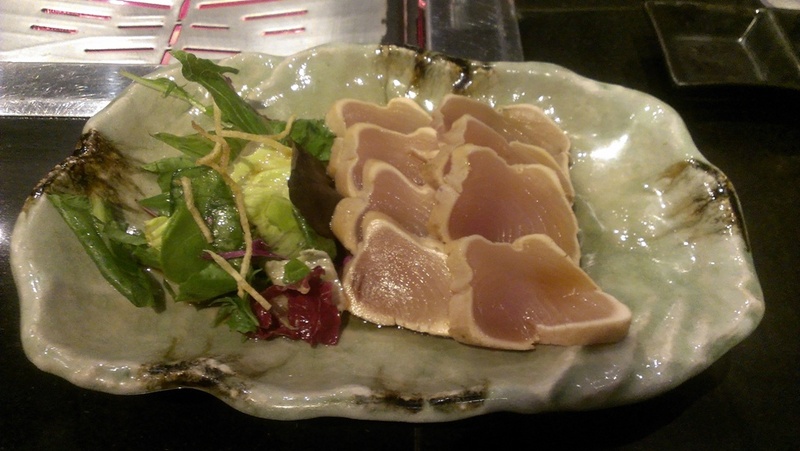 I was invited to try Japanese BBQ at Yakinikuya on Robson and Jervis Street and blog about it. Surprisingly this restaurant had never caught my eye before and who doesn’t like BBQ right? The only other Japanese BBQ that I’ve tried is Gyu-Kaku so I’ll be comparing the two. 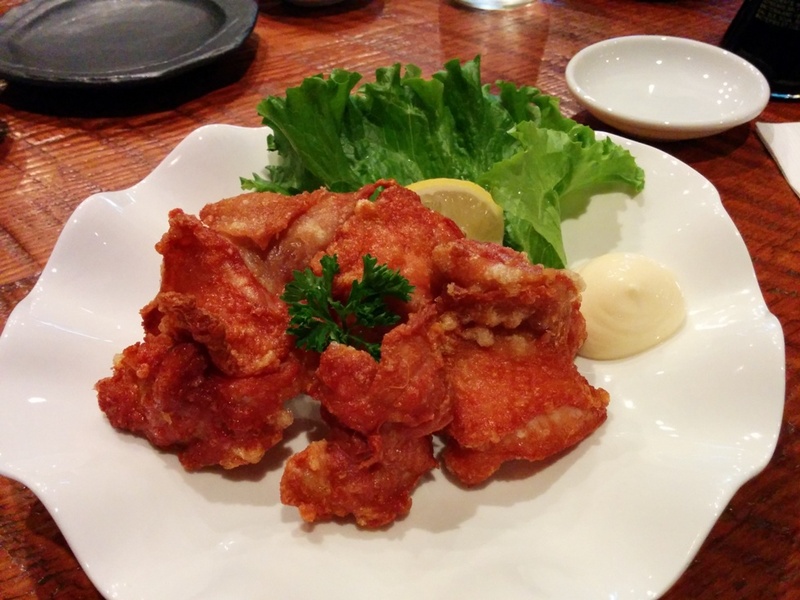 Yakinikuya is an authentic Japanese BBQ restaurant with some Korean dishes as well. In addition to BBQ items, they also offer appetizers, sushi and sashimi. They also have combos that are meant to be shared by 2 people. This was the Sakura combo ($44) which seemed to be the best deal. 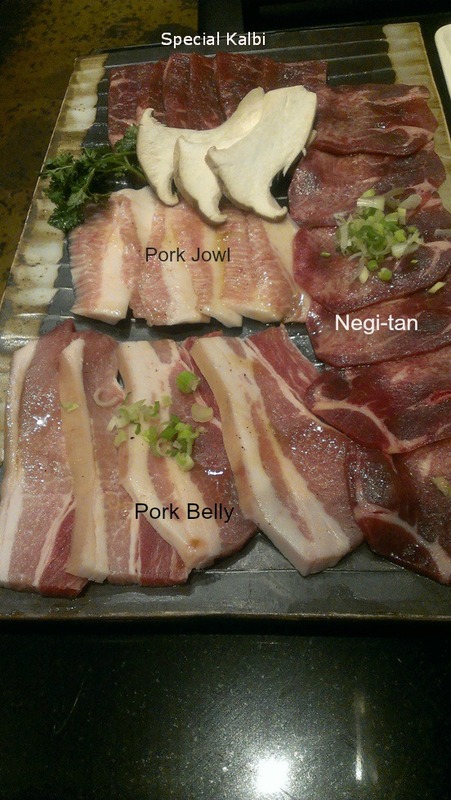 It included “Korean Style Kalbi 180g; Special Kalbi 120g; Negi – Tan 120g; Pork Belly 120g; Pork Jowl 120g; 4 Side Dishes; 2 Miso Soups; and 2 Steamed Rice“. I like how they include how many grams of each meat was in the set although I couldn’t really estimate the weight of meat anyway… The presentation was nice and I like how they included 3 pieces of king oyster mushroom. My favourite out of the set was the negi-tan aka beef tongue with green onion! It was thinly sliced and slightly chewy. The owner came by and suggested we squeeze the slice of lemon into the salt that we were provided and ok that was the best idea ever! It was even tastier with the lemon salt combo! I didn’t really taste the green onions though and it was more like for decoration to me. The pork belly was quite fatty and after being cooked that was more obvious than ever and same with the pork jowl but I think that might be the way it is? All the meats were well marinated but not overly so. We were also provided with some additional sauces for dipping: a spicy sauce, a regular soy sauce and a miso sauce? I mainly used the spicy sauce which was actually not spicy in my opinion and I wasn’t too fond of the miso one so I didn’t use it much. This was the Korean special kalbi that didn’t fit on the other dish. This was beef short ribs with the bone in and marinated in their homemade sauce. 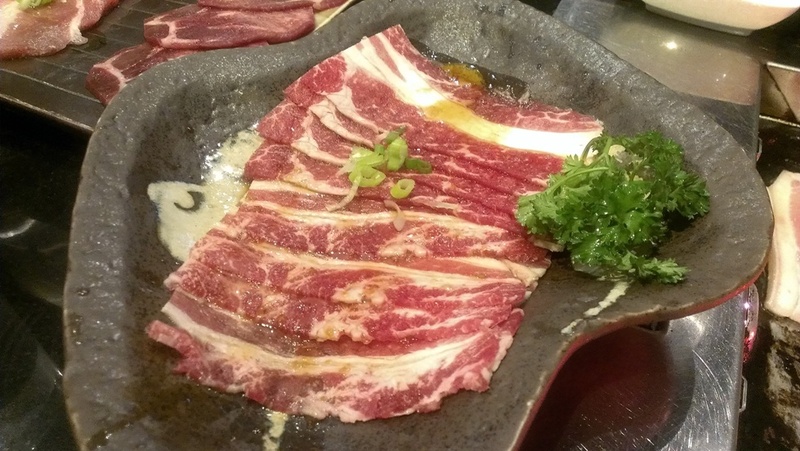 The special kalbi on the other hand was described as a special cut of beef short ribs fully marbled in their homemade sauce and no bone. Both tasted good though! I think one had a sweeter marinade than the other? If you want to see what other meats they have visit their menu here. I think for the Sakura combo, everything ordered separately would be around $43 so then the other $1 would cover the 2 miso soups, rice and side dishes. 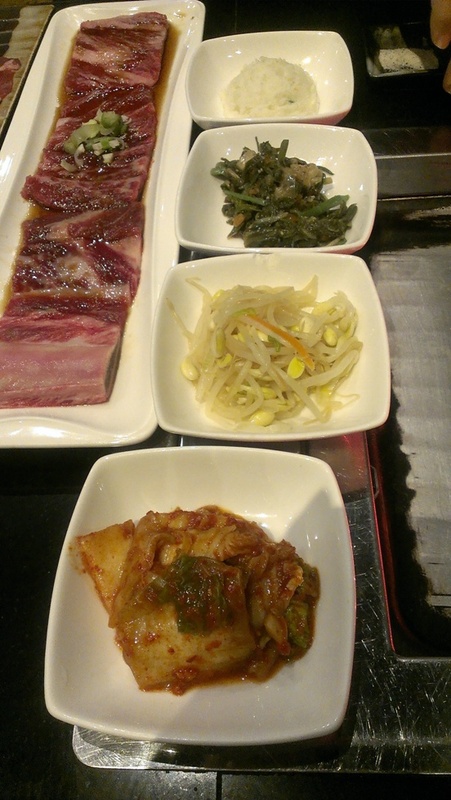 The side dishes were kimchi, bean sprouts, marinated vegetables and a mashed potato salad. My favourites were the vegetables and the potato salad. The vegetables had a slight sesame oil taste to it and the potato salad was really creamy and just slightly sweet. You can always refill the sides too. 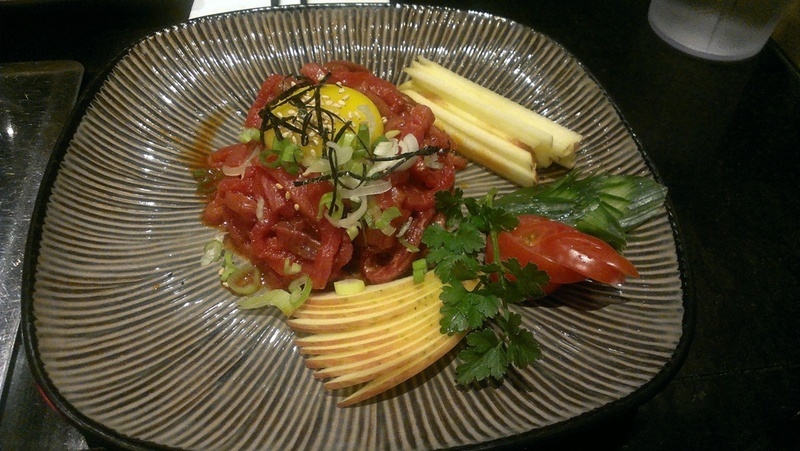 This was the Yukke ($14) which was Korean style beef sashimi with an egg and mixed with sesame oil. It was also nicely garnished with thin apple slices and a cherry tomato. I actually don’t think I’ve tried this before so I don’t have much to compare it with but I enjoyed the mild sesame flavour with the egg mixed in it was very smooth? This was one of my other favourites! The Toro Beef ($7) which is beef belly was well marbled and flavourful. 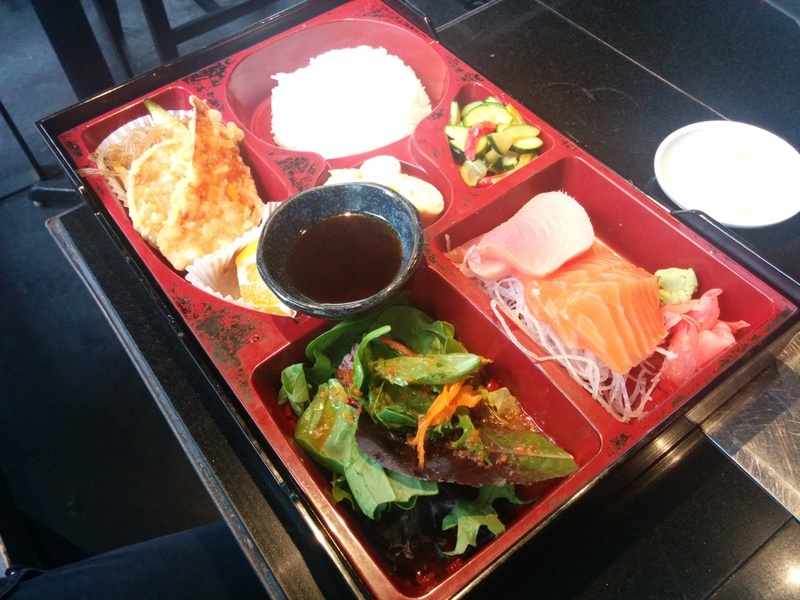 This was not part of the Sakura Combo but worth ordering in addition to it! 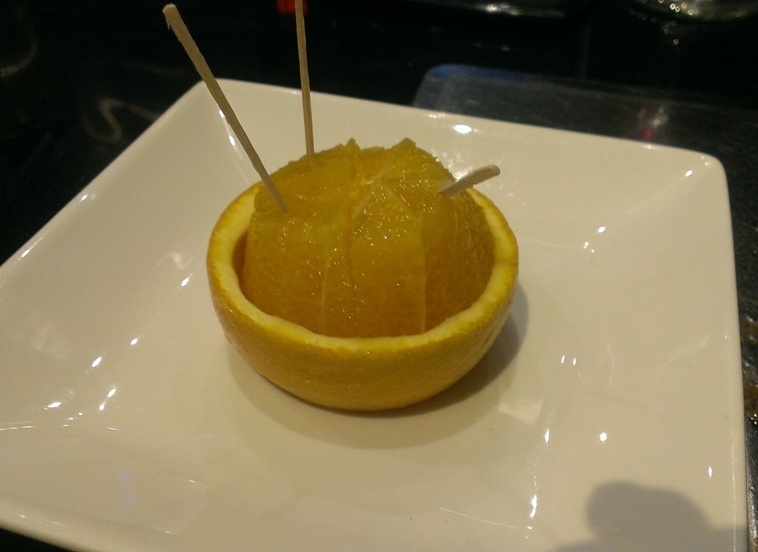 Orange slices were served to end off the meal. I am by no means a connoisseur in BBQ food but I enjoyed the food here (except the tuna tataki) and the price is similar to Gyu-Kaku and I feel like even the interior is sort of decorated the same (i.e. black wood furniture). If you like Gyu-Kaku, I would recommend giving this place a try! They seemed to have a good amount of business when I went on a Tuesday night so I’m not sure why they need me to blog about it (other than a lack of blog posts?). 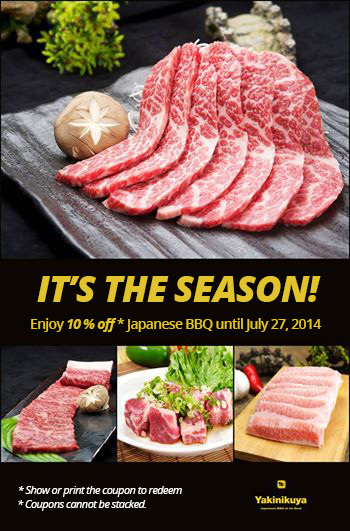 ALSO, Yakinikuya would also like to provide all my readers with a 10% off coupon! Just print it out or show it on your phone for the discount and it expires July 27! I’ve never done this before haha :) Let me know if you actually use it! You can also visit their Facebook page for other promotions. Disclaimer: My meal was compensated for and I was invited to write this post. Opinions are my own. This entry was posted in Food Reviews, Japanese and tagged BBQ, discounts, Japanese, Korean BBQ. I was gifted with two boxes of chocolates from La Chocolaterie! 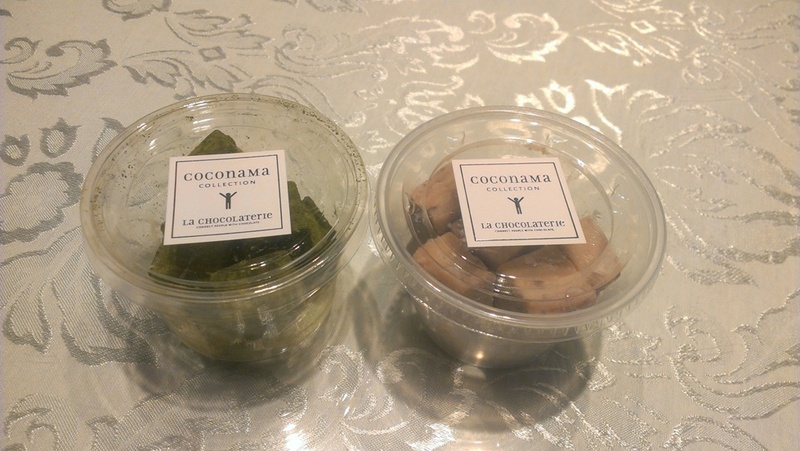 They are located inside the Japanese market Izumiya. I’ve never been to their store though. I think they also set up booths at farmer’s markets and places like UBC since I’ve seen them there before. The boxes come with 9 pieces each. This was Sakura flavoured. I’m not sure what it was exactly but it tasted a bit salty? 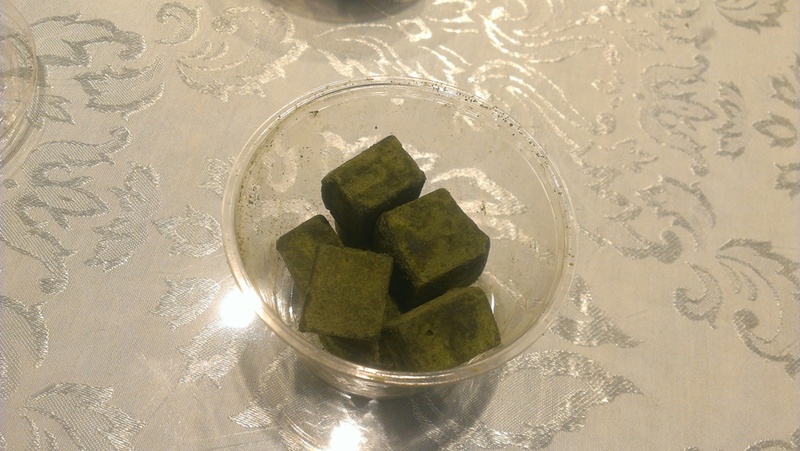 This was the Green Tea flavor and there was a distinct green tea flavour in every piece. The chocolates taste very smooth and creamy. The texture is almost like those cheesecake cubes you add to your froyo from Qoola but less creamy and thick. They’re very light and not too sweet and they also have some other unique fruity flavours. The chocolates are really good but they’re a bit pricey since it’s $5 for a box. 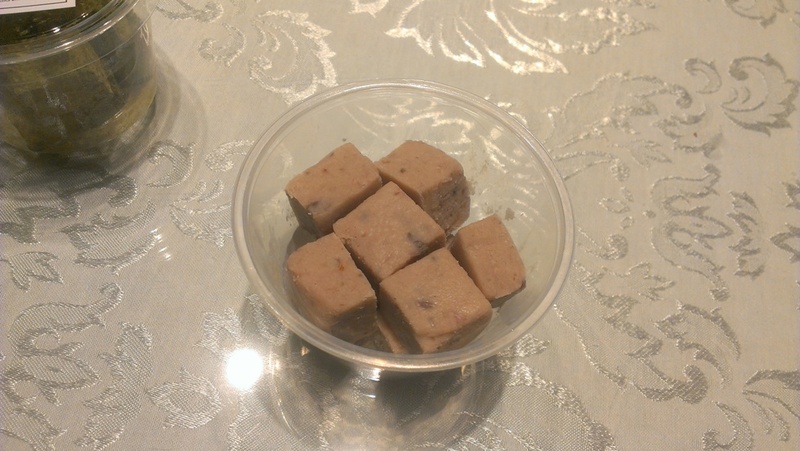 This entry was posted in Desserts, Food Reviews and tagged chocolates, desserts, Japanese. 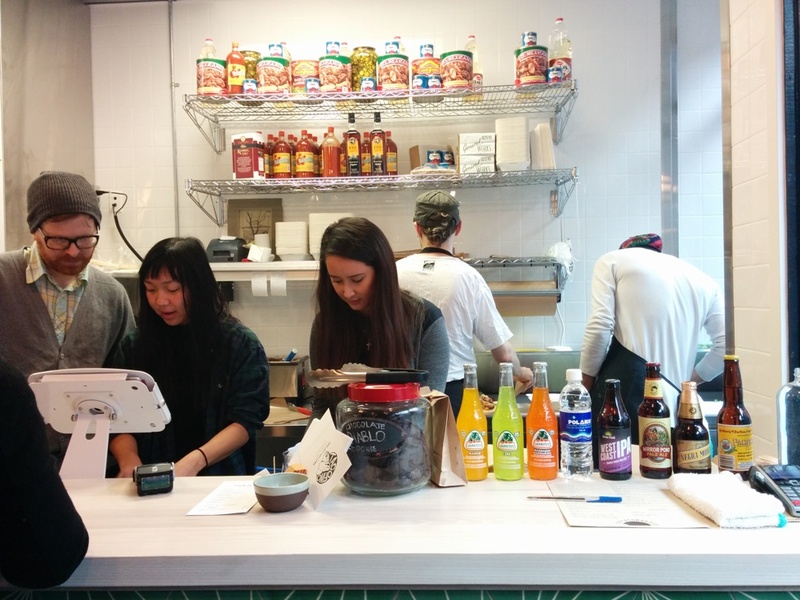 Zakkushi just started serving lunch Wed-Sun at their Main St. location. According to their website, they will be serving lunch everyday from May onwards. I got the Zakkushi set which seemed to be the best deal with 4 kinds of skewers (chicken, pork, garlic stub and seasonable vegetables), a daily appetizer which was marinated lotus root with sesame seeds, miso soup, 3 pieces of sashimi (salmon and tuna), and Soboro don (seasoned and minced chicken with egg on rice. I liked that there was so much variety in one lunch set. The stars of the set were the skewers and they were all good and well seasoned. I wish there was more! I’m not sure if I’ve eaten okra before so it tasted a bit weird to me. For the rice, I think it would’ve been nice if they used a poached egg instead of the shredded egg. Since each skewer costs around $2 I think this set was worth it. Here’s the Premium Combo with Kobe prime rib, chicken, pork and okra. Basically the only difference is the Kobe prime rib and it comes on it’s own little grill rack! Not sure why that’s necessary…? P-toro Don with poached egg, seaweed and green onion sauce. This looked pretty good too! This place is pretty small so you should make a reservation if you have a large group. Also, all their desserts are $2.80 during lunch time! Check out their lunch menu here. You can also read my post on their dinner here. 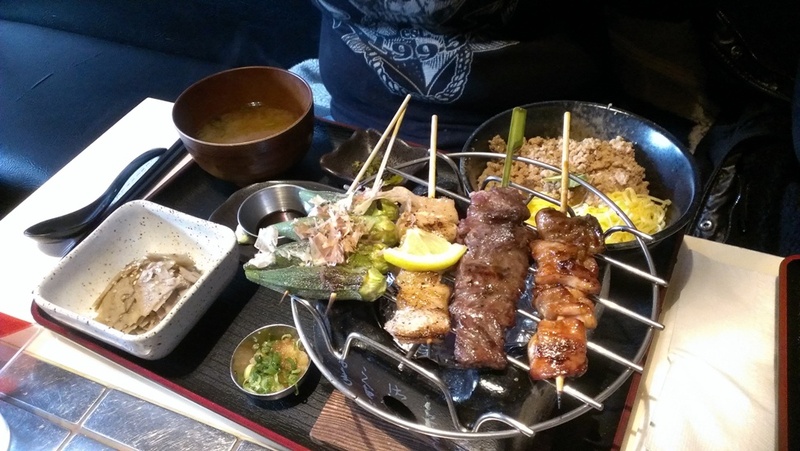 This entry was posted in Food Reviews, Japanese and tagged BBQ, Japanese, lunch, skewers. I came across Ebi Ten on Robson and their pictures seemed enticing enough so I decided to try it. Yeah all it takes are some nice pictures (read: marketing) to get my attention! I tried to keep my expectations low though. There aren’t that many seats inside and their whole menu is basically up there. 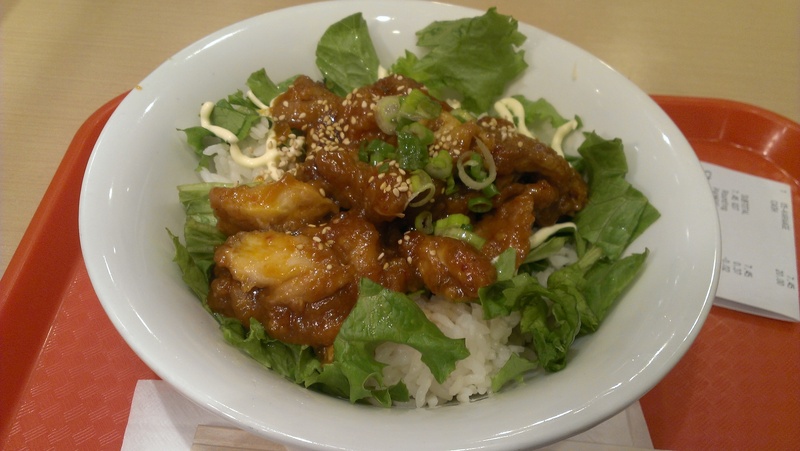 I have a thing for chicken and spicy things so I was drawn to the Sweet Chili Chicken on Rice Bowl. This place seems pretty popular and if you want cheap and filling this seems to cover it. 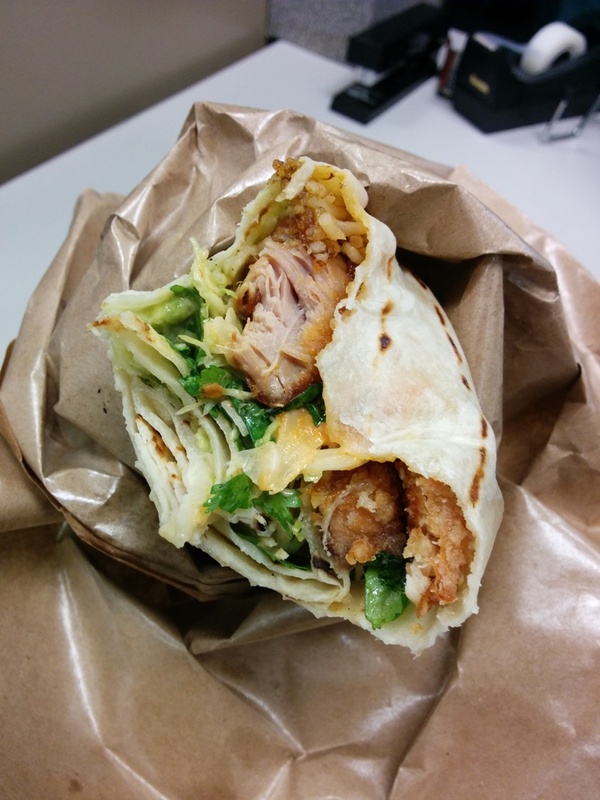 This entry was posted in Fast Food, Food Reviews, Japanese and tagged chicken, fast food, Japanese.